Hey there! I’m Chelsey, and I’m so excited to welcome you into my kitchen. Unlike a lot of bakers out there, I didn’t grow up in the kitchen with my Mom or Grandma. I don’t have a treasure trove of family recipes, and I had absolutely no background in baking before I found my passion for it at age 22. I audaciously decided to make a birthday cake from scratch for a coworker, and I was hooked. That’s part of what makes baking so exciting for me!! There’s always a new flavor to test out, and a challenging decorating technique to play around with. I’ve taught myself through trial and error, and love to share everything that I’ve learned along the way. I also love to simplify recipes when possible, to make them a bit more approachable. I hope to encourage other home bakers to find their own joy in the kitchen, and see that baking a cake from scratch isn’t as intimidating as it may seem. In fact, it may be just what you need after a stressful day! In my kitchen, I find myself at ease. It’s the only place I truly lose track of time. I get so blissfully caught up in smoothing the frosting just so, or getting the perfect shot of a finished cake. It was my favorite thing to do when I got home from work, and I still feel the same way about it now (even though it’s my job now!). I recently left my day job in corporate finance to pursue Chelsweets full-time. If you want to know more about that, I shared some pretty personal posts about why I quit my job, and all the things I considered before leaving my corporate job. While I currently live in NYC, I was born and raised in Seattle. I love New York for many reasons, but I will always be grateful to this city for helping me discover my love of baking. I started baking when I first moved here, in a kitchen the size of a closet. Baking has allowed me to meet so many wonderful people, and has led to some amazing opportunities. I’ve been featured by Buzzfeed, Instagram, The Wall Street Journal, Bloomberg, amNewYork, Business Insider, Cosmopolitan, Country Living, and Pop Sugar. I have also been on the Ben and Pickler show, and Home & Family, which were both amazing! Right now I’m focusing on content creation across my social platforms, and my ongoing digital partnership with the Food Network. I don’t sell any of my cakes, and give the cakes I make to my friends, family, and local businesses. To see more of the cakes I’ve made, you can follow me on Instagram, where I share everything I make. I also share my work on Facebook! For in-depth, full-length tutorials, you can visit my YouTube channel. Be sure to subscribe so you don’t miss any new cakes! *DISCLOSURE: This site also contains other affiliate links which means that, at no additional cost to you, I may earn a small commission if you make a purchase. Read my full disclosure policy here. Deciros que teneis un blog muy bueno y bien trabajado. PS – I love the look the guy behind you has on his face. Thanks for stopping by Ginger and Cream and giving me a follow! I really appreciate it! Your blog looks amazeballs! When I finally get my new kitchen up and running I will be sure to get on here for some trying out of your scrummy sounding recipes! Ahh thanks so much!! I love your blog too 😀 Thanks for the follow back! Hi I am from Indianapolis Indiana. Your style is everything I love. My goal is to be as great as you. If you ever need an employee in the future, I would love to work under you. You do great work! I’m trying to follow my life long dream of baking…but might I say you’re definitely an inspiration to me! I also am self taught, I also love Art and drawing. So, to combine both my favorite things into one is exciting! I love how you make all your recipes able to replicate and versatile for other bakers! Thanks again Chelsea for sharing your gift to all of us! That is so sweet 🙂 It’s all about having a creative outlet!!! Best of luck, and happy baking! Just stumbled upon your website and your cakes and creations are amazing!! I was just wondering, since you have a full time job how do you have time for all of this?? Cake making is super time consuming! Thanks 🙂 To be honest, it’s challenging!! I just don’t sleep very much! I came across your Youtube channel when looking up a drip cake tutorial. I think your finance background gives you fantastic attention to detail and it’s so helpful when you create such helpful tutorials! Keep up the amazing work! Do you enjoy finance? I’m an engineer by background and sometimes just want to drop it all and bake for the rest of my life. How do you grapple with this? I need a moist carvable chocolate cake. My Granddaughter wants me to make her a Titanic cake. What would you suggest? I carve the layers while they’re chilled to make it easier to cut!I use a serrated knife. Thank you, I have another question, I was going to use 13 x 9 pans to make the Titanic. Should I double the above recipe? And are there any frostings that would work better than others? She is not a fondant type, and I just want to be the Grandma I never had. Thank you! Hello Chel – I want to make a sprinkles or cake filled with M and M’s for a baby shower in a couple of weeks. I want to use a 10″ pan with your recipe. I need to make the cake the night before, will the M and M’s and sprinkles be ok overnight – or do I need to plan to put the cake together the morning of the shower? Candy coating can definitely bleed a little bit when chilled, But since it’s on the inside of the cake, I think it should be fine! I love your cakes and tutorials. Do you have suggestions on what items a person starting out should purchase as far as cake pans and tools for icing cakes? I’ve heard you say you purchased items off amazon just not sure where to start. Hi chels, where did you get the camera for your Instagram videoes? And where do you put the camera when you make the videoes for instagram? I bake and I’m interested in making similar videoes, thanks. I ordered my canon rebel Ti5 on amazon! I put it on a tripod in front of my counter when I film. Hi. How many days in advance can I make the buttercream? How long will it stay fresh? Hi Chelsea, can you advise on a champagne or pink champagne extract? Need to make 120 pink champagne cupcakes for nieces shower and that is too many bottles of pink champagnes!! Looking for a recipe to use extract. I’ve never baked with a champagne extract before, so sadly I can’t! I’ve only ever used normal champange, so sorry!! Hi Chelsea! I was wondering if you had the recipe for your football field cake posted. I have looked but might have missed it. I am hoping to make it for my nephews birthday. Any help would be very much appreciated. I absolutely enjoy all of your post and videos, your YouTube page is my daily TV show now ?..keep up the good work. You’re such and inspiration send Texas blessings and love ? Hey Chelsea! I want to make my daughter a rainbow cake for her birthday but am worried about being short on time with everything else I’ll have to do. Could I bake and freeze the layers then just take them out in time to decorate and get to room temp? Would this make the cakes dry? What steps could I do before the day of the party? Thanks! Definitely, that’s what I usually do! the cakes stay super moist, just wrap them in plastic wrap or place them in an airtight container. I actually frost the layers while they’re still cool, it makes them easier to stack and frost (less crumbing)! Hey! Love love love your cakes! I attempted my first cake yesterday. It was yummy and it looked halfway okay! I have one question. What do you do if your buttercream starts to set up while you frosting your cake? Thank you so much! You mean set in the bowl? I usually lay plastic wrap over it when I’m not using it (i.e. when the crumb coat is chilling, etc. ), or store it in a Tupperware container, so I can just put the lid on it when I’m not using it. Have you ever done a shark cake? It is shark week, after all! ? I haven’t but i feel like i missed the boat on this one! I so want to though! next year i HAVE TO! Love all of your cakes! And your vanilla cake recipe is delicious! About how many servings do you think your cakes are? Hi I am looking for your mom cakes with the raspberry on it and the frosting also. Hi Chelsey! I am such a huge fan of yours! I have been decorating cakes for friends and friends of friends for a little while now, and one thing I struggle with is I never know what size of cake to make! Usually they just send me a picture of what they want the cake to look like. I’m always worried I’m giving them too little or too much. 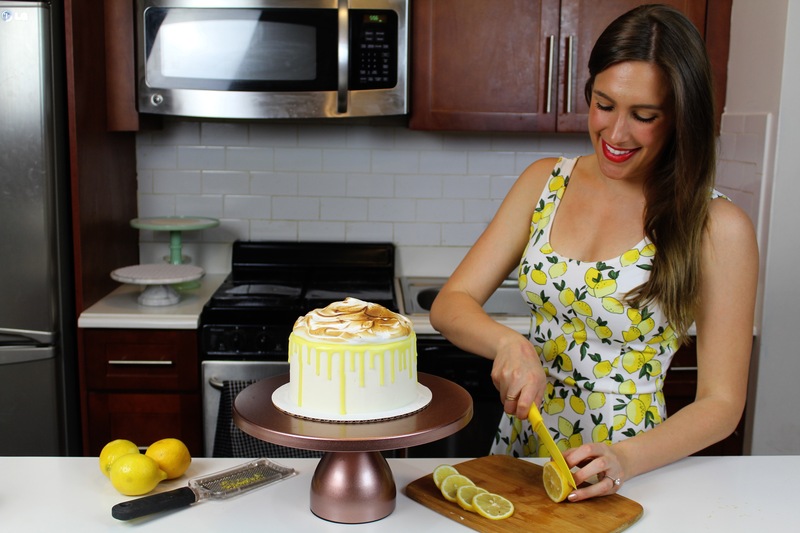 Do you have a standard size cake that you use (like, do you always make a 3 layer 8″ cake, or whatever, unless they ask for something else?) If you can give me a little advice, I’d really appreciate it! Hi Chelsey! I am a big fan of your blog and turn to it a lot for tips and inspiration! I have been making cakes for friends and friends of friends for a little while now and one thing I stuggle with when I have an order is knowing how big to make the cake (usually people just send me a picture of what they want their cake to look like!). I was wondering if you have a standard size you use for your cakes, like 3 – 8” layers or whatever. I appreciate any advice, thank you! Hi Chelsey, you say you use 10″ pans. Do you use them all the time or you use what the recipes says to use? Like the red velvet cake says 5 – 7″ round pans. I actually hardly every use 10 inch pans! I almost always use 7 or 8 inch pans, and sometimes will use a half batch of cake batter to make small cakes with 6 inch cake layers. I’m not a baker, but would like to make a cake in addition to my pies this Thanksgiving. So, I have what some may think is a silly question. How far in advance can I make the cake and still have great tasting frosting? Do you store you cakes in a fridge once they are made or in the pantry? Thank you so much for your help. I store my frosted cake in the fridge if I make it in advance! It can stay good in the fridge for up to a week, or the freezer for several weeks. Just be sure to transition the cake from the freezer to the fridge before you bring it to room temperature, to reduce the temperature shock, if you go that route. Happy baking!! Hey Chels. I really want to make your fundetti cookie dough cake as my wedding cake where do you get the cookie dough? Simply stated, I love your site, Chelsey. I want you to know I don’t say this just because I am your Grandpa. haha thank you Grandpa 🙂 I love you!!!! I came across the cutest Holiday Lama cake online by Renshaw Baking Co. and thought of you. Just sharing the link so you can see it. It might inspire you. Hi! I love your tutorials and pictures and site! I’m going to make the ultimate Nutella cake for my husbands birthday. Which chocolate cake recipe do you recommend? Yolanda’s or you go to chocolate cake recipe? Thanks so much! I like my go-to chocolate layer cake recipe, with black cocoa!! Chelsea! I can’t say enough words of gratitude I have towards you and your awesome blog/youtube videos. It is because of you, your posts and your videos that have made my passion for baking become truly a thing I look forward to after work. Like you, I work in Finance and found out what makes me feel good after a long day of work and that is BAKING. I love reading your story and I am patiently waiting for all the amazing content that is coming my way! Thank you for being my “silent” mentor and someone who cheers me up when I have had a long day. Chantelle that is the sweetest comment!! I’m so happy that you’ve found joy in the kitchen too! That’s literally the goal of chelsweets, hoping that I can help others find the same happiness I found through baking 🙂 We sound like two peas in a pod, that’s exactly how I used to feel too! I cried a little reading this, and I really appreciate you sharing this ?? It’s definitely been hard transitioning to doing chelsweets full-time, but comments like this are so incredibly encouraging! What causes completely mixed in color into buttercream after applied to cake for final coat to change shades in places when smoothing? Am I smoothing too much?! I use the Viva towel method. sometimes heat can affect the color? maybe the warmth from your hands as you press the paper towel into it is changing it? or if the buttercream has started to crust?? Hi Chelsea! This might be a long shot, but would there be any chance I could ever pick your brain about how you got started? Hi Chelsea! I was wondering if you have ever done an angel food cake-and if so I need a tutorial! Thank you!